August is a great month to spot western gray whales and northern fur seals. The summer months are also ideal for camping by a series of warm lakes and lagoons, or indulging in water sports. Summer is the feeding season for the endangered western gray whales, a species that is believed to be 30 million years old. The whales, which grow to a length of almost 15 meters and weigh around 40 tons, can be spotted from the eastern coast of the island. 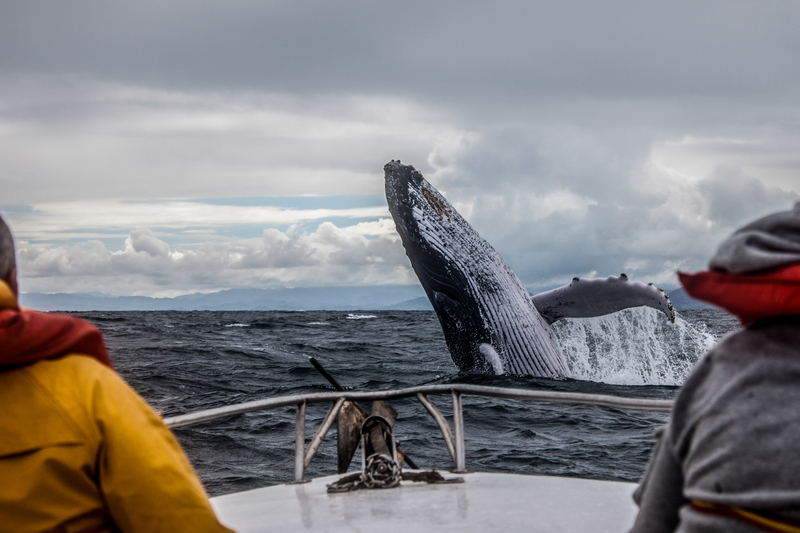 August is the best month to catch a glimpse of the whales. They migrate to the waters near Sakhalin to feed on shrimp and small fish. The eastern coast of Sakhalin is a short drive away from Yuzhno-Sakhalinsk, the capital of the Sakhalin Region. Environmentalists believe that there are only a hundred western gray whales in the Asian Pacific coast. These majestic whales go back to the eastern Pacific Ocean in the winter months for breeding. It’s easier to spot other marine mammals. Just east of the southern part of Sakhalin is a unique and small island that is a nursery for seals. The Tyuleniy (Russian for seal) Island is just 1.6 km long and 19 meters wide, and hosts both a large population of seals and birds. The seal rookery is one of the most fascinating natural sites anywhere in Russia. The northern fur seals that live near the island can also be spotted off the east coast of Sakhalin and are among the most sociable species of marine life. They often come close to fishing boats. The bird colony on the island also has variety of sea birds, who take up the spaces left vacant by the seals. In the summer, one can spot common murres and kittiwake, crested auklets, Siberian rubythroats, red-necked stints and narcissus flycatchers, among other species. Sakhalin has 16,000 lakes that are spread across the 948-km long island. It’s only the lakes and lagoons in the southern part of the island that are warm enough to swim in. The Tunnaicha Lake, which is about 30 kilometres away from Yuzhno-Sakhalinsk, is surrounded by mountains and is one of many tranquil spots near the capital. Parallel to Tunnaciha and separated by a narrow stretch of land from the Sea of Okhotsk or the North Pacific Ocean, is the Izmenchovoe Lake. Sakhaliners believe the land around the lake contains minerals, and often take some soil back with them to use as fertilisers in their dachas. Southern Sakhalin has several lakes and lagoons that are popular with fishermen including Busse, a lagoon known for its delicious scallops. Busse is a one-hour drive from the world’s largest gas-liquefying plant. In the summer, the series of lakes in southern Sakhalin known as the Tyoplie Ozyora (warm lakes), are a great place to camp out and swim. If you’re interested in Soviet history, then don’t miss visiting one of the largest marine collective farms in the former Soviet Union. The Kirov collective farm, near the town of Korsakov, was established in May 1959, and is still functional. The collective farm, which was formed by 15 fishing cooperatives, is one of the rare collective farms that survived the demise of the USSR. You can buy salmon, pollock, cod, flounder and herring, among other varieties of fish and sea food. Sakhalin is famous for its seafood, and the local cuisine reflects this richness in marine products. Many shops sell salads with shrimp, squid and crab. It is also easy to find oysters, scallops, crabs and various types of fish in the markets. The warm lakes are a popular spot on weekends for windsurfers. The weather can be unpredictable at times, but the best months are August and September. Busse is popular for kayaking and canoeing. Fishermen in diving suits row to the center of the lake in canoes to catch scallops. There have been complaints from long-term visitors that water-skiers are destroying the peace and quiet of some of the larger lakes. However, this is just an effect of the immense wealth that was created on the island after the oil and gas boom. Those looking to go diving should head to the southernmost end of the island. In August and September, the warm waters of the Aniva Bay, which is north of the Japanese island of Hokkaido, are warm enough to swim in. Adventurers swim from the edge of Sakhalin to the Aniva Cape lighthouse, which was built by Japan in 1939. Swimmers and divers are always advised to exercise caution, since there have been occasional great white shark sightings off Aniva Bay. The warm weather in Sakhalin stretches on usually till the beginning of October, making it an ideal place to enjoy a Russian summer. There are direct flights from Yuzhno-Sakhalinsk to Seoul, Beijing, Harbin and Sapporo. There are also charter flights to Tokyo, Osaka and Nha Trang. Many Sakhalin residents use Vladivostok as a hub to travel to Asian cities. There are three daily flights from Yuzhno-Sakhalinsk to Moscow, and several domestic flights to Khabarovsk and Vladivostok. From May to October, there is a daily ferry service from Wakanai in Japan’s Hokkaido Prefecture to Korsakov in Sakhalin. A daily ferry service from Kholmsk in southwestern Sakhalin to Vanino in the Khabarovsk Territory runs throughout the year. Travelers can connect to the Baikal-Amur Line and the Trans Siberian Railway from Vanino.